John Smith, who served as Foster’s Town Sergeant for many years, has the dubious distinction of being Rhode Island’s first (known) law enforcement officer to die in the line of duty. On June 21, 1832, Smith was attempting to arrest a man wanted by Connecticut authorities when the suspect killed him with an axe. Twenty years later on May 18, 1852, Officer William T. Pullan and his partner, both of the Providence Night Watch, had just arrested four men on Broad Street, when an assailant ran up and struck Pullen in the head with a club killing him. Newport patrolman Eugene Baker died on the afternoon of April 22, 1884, when he tried to take a man into custody after a bloody confrontation in a saloon. Although art and literature have portrayed “olde” New England as idyllic and quaint, these incidents illustrate that the job of policing has always been difficult and dangerous. The National Law Enforcement Memorial in Washington D.C. has the names of more than 22,500 officers who’ve made the ultimate sacrifice since 1791, and more names are added every year. To date, 51of those names are of Rhode Islanders. Nobody can say for sure how many of America’s peace officers have lost their lives in the performance of their duty, for until the 1980s such information wasn’t collected, and the institutional memory of most departments only dated back as far as what the oldest member could recall. “New” information periodically comes to light as amateur historians comb old newspaper morgues, microfilm collections, and town records, but the true number will likely never be known. Most of the known incidents in Rhode Island occurred in the 1900s, beginning with Kent County Deputy Sheriff James V. Fish, who on January 16, 1901, was killed in an East Greenwich roadhouse as he attempted to take three men into custody. The following year Cumberland officer Herbert Moore, and Narragansett officer Joseph W. Westlake, both lost their lives while attempting to make arrests. Providence Patrolman John F. Brennan was killed April 2, 1911 by two men he was attempting to take into custody. Trooper Arthur L. Staples, Jr., lost his life December 18, 1931, while arresting two car thieves on Tower Hill Road in North Kingstown. State Police Lieutenant Arnold L. Poole was killed May 30, 1934, while serving an arrest warrant. Brown University Officer Joseph F. Doyle died May 8, 1988 from head injuries he received while struggling with a suspect. 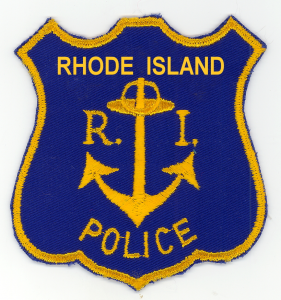 Providence Patrolman Thomas A. Mulvey, (September 19, 1931), Woonsocket Officer Albert A. Lemoine, (October 2, 1937), and Pawtucket Officer Doreen Tomlinson, (June 26, 1984), were all killed in vehicular pursuits. East Providence Officer James R. Caruso was killed January 6, 1958 by the driver of in a car he’d been chasing. Rhode Island state troopers John Weber, (June 17, 1925), Joseph J. Gallivan, (June 22, 1937) Bradford G. Mott, (May 6, 1941), and Sgt. Walter J. Burgess, (November 14, 1959), as well as North Kingstown lieutenant Raymond W. Bennett, (November 10, 1964), and Providence Sergeant Maxwell Dorley, (April 19, 2012), were all lost in motor vehicle crashes during the performance of their duty. Newport Patrolman Robert C. Scott, (March 20, 1922), Coventry Officer Stanley Siembab, (January 21, 1939), and three Warwick Officers, Kenneth R. Fratus, (May 21, 1971), Reserve Captain Christopher Feeney, (December 20, 1971), and Patrolman Donald R. Casasanta, (July 11, 1981), were all hit by motor vehicles while directing traffic. Warwick officers John B. Gendron, (November 24, 1902) and Walter G. McQuarry, (June 27, 1911), as well as Cranston Officer Henry R. Johnson, (August 14, 1930), were all killed while investigating “suspicious persons”. Pawtucket Officer William W. Gemmell was fatally injured June 19, 1908, when he intervened in a sidewalk domestic dispute. On September 30, 1952, a bank-robber armed with a deer rifle and holding three hostages killed Pawtucket Officer Charles Patnaude as he exited the department’s patrol wagon. Two other Pawtucket Officers, Detective Lieutenant Thomas Trusedale, and Patrolman Emil A. Newberg, where both killed on June 30, 1958, by a suicidal man who’d barricaded himself in a bathroom. On February 12, 1928, two Providence officers, Sergeant William A. Flynn, and Patrolman James O’Brien, were killed while conducting a liquor raid. Providence Sergeant Stephen Shaw was killed when he entered a home in search of a robbery suspect on February 3, 1994. Assistant Inspector Patrick J. Clune of the Newport Police, (March 5, 1938), and Providence Detective Sergeant James L. Allen, (April 17, 2005), both received fatal injuries within their police stations. Corrections Officer Harry McVay was killed during an escape attempt on April 25, 1925, and Corrections Officer Donald Price was stabbed to death at his post on June 22, 1973. And some deaths were tragic accidents brought by fellow officers, as with the case of East Providence Police Major Alister C, McGregor who was killed during a training accident on December 27, 2001, and Providence Sergeant Cornell Young Jr., who was mistaken for a suspect on January 28, 2000. Yet not all deaths were due to violence. Cranston’s Chief of Police John Bigbee died of “blood poisoning” on December 11, 1908 from an injury he received at a fire. Providence mounted patrolman James P. Cavanaugh died December 26, 1916, from injuries he received after being thrown from his horse. On August 18, 1925, Pawtucket Officer David B. Burns drowned when he attempted to rescue a child who’d been thrown in the water after the boiler on the steamship Mackinac exploded. Trooper Daniel L. O’Brien drowned while attempting to rescue persons trapped by rising waters during Hurricane Carol in 1954. On December 10, 1968, Smithfield Sergeant Norman Vezina drowned while attempting to rescue a child who’d fallen through ice on a pond. Other officers suffered fatal heart attacks while either chasing or struggling with suspects/arrestees. These include: Pawtucket Patrolman Samuel W. Slocum, (February 4, 1906), Captain Peter F. Pepin of the East Providence Police, (November 4, 1922), Cranston Sergeant Walter C. Busby, (February 12, 1979), and Corrections Officer Ernest R. Grossguth, (March 26, 1995). Woonsocket patrolman Edward Clifford died of a stroke while walking his beat in 1905. There is of course more to each of these stories, but unfortunately space does not permit. Interested persons may go to the National Law Enforcement Memorial website at www.nleomf.org for more information. To the centurions who protect our streets, thank you!